Ivory Coast incumbent President Alassane Ouattara, center, dances with his wife Dominique Ouattara, left, during his election rally in Abidjan, Ivory Coast, Oct. 23, 2015. In Ivory Coast, more than six million voters are expected to take part Sunday in the first round of the West African nation's presidential election. As campaigning ended on Friday, another candidate pulled out of the race, claiming conditions are unfair for anyone challenging President Alassane Ouattara. The 73-year-old economist, head of state since 2011, says he wants a "first-round knockout" victory. Six contestants are now left trying to thwart incumbent President Alassane Ouattara's bid for a second term. Sunday's vote is seen as an important test for the country, following post-election violence five years ago that left at least 3,000 people dead. In Abidjan, the commercial capital, the state electoral commission has erected giant billboards exhorting everyone to vote. "Preventing somebody from voting is anti-democratic," the messages say. "Everybody is free to choose the candidate they want." Some opposition candidates do not believe the elections will be free and fair. Former prime minister Charles Konan Banny pulled out of the race on Friday. He said the presidential election was tarnished by irregularities even before the first votes could be cast, and that this "unfair process" is what prompted him to withdraw. FILE - Charles Konan Banny (L), independent candidate for the 2015 presidential election, shakes hands with Independent Electoral Commission (CEI) President Youssouf Bakayoko (R). Banny is the third of Ouattara's challengers to drop out over the past few weeks. All claimed that the electoral commission is biased in favor of the incumbent president, and that the list of voters has many double entries, a potential source of vote fraud. The electoral commission said Friday it has investigated those allegations, but found no conclusive evidence of unfair conditions. On the other side of this city of nearly five million people, Ouattara presided at his final campaign rally Friday. 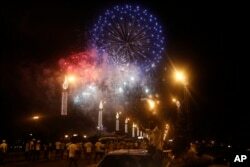 Famous Ivorian artists, fireworks over the city. The last rally surely was meant to impress. Fireworks explode during an election rally by Ivory Coast incumbent President Alassane Ouattara in Abidjan, Oct. 23, 2015. 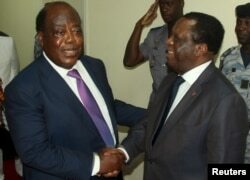 President Ouattara seemed unfazed by Banny's withdrawal. "How many candidates are there now?" Ouattara asked. He is calling for a massive turnout by his supporters, and he wants a "first-round knockout" victory in Sunday's balloting. The electoral commission has accredited 7,000 local and international monitors to observe voting across the country. Results of Sunday's ballot are expected within 48 hours.